We don’t hate on coffee. We don’t ask you to give up your coffee. We simply believe that you don’t have to live with its limitations. No Ritual AM Reviews Found. Contains milk ingredients. Produced in a facility that also processes peanuts, tree nuts, wheat and eggs. Optimize your mind and body. Never miss your daily Ritual. 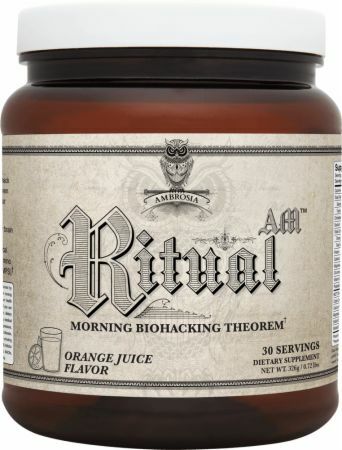 Mix Ritual into your morning coffee or into 8oz of warm or cold water - it will ignite your mind, body and tastebuds for the entire day. 1 Scoop - Recommended Serving. Warnings: This product is only intended to be consumed by healthy adults 18 years of age or older. Pregnant or nursing women should not use this product. Consult with your health care provider before using this product, especially if you are taking any prescription, over the counter medication, dietary supplement product or if you have any pre-existing medical condition including but not limited to: high or low blood pressure, cardiac arrhythmia, stroke, heart, liver, kidney, or thyroid disease, seizure disorder, psychiatric disease, diabetes, difficulty urinating due to prostrate enlargement or if you are taking a MAO-B inhibitor or any other medication, including but not limited to MAOIs, SSRIs or any other compounds with serotonergic activity.